Every Valentine’s Day veterinary emergency hospitals are busy treating pets that have eaten their owner’s Valentine chocolate or bouquet of flowers, both of which can be fatal to pets. Caring for a seriously ill and beloved pet is not only scary, but costly, and can be avoided with some simple precautions, says veterinary nurse Tabitha Owens of The Cat Practice veterinary hospital in Birmingham, Michigan. Owens says that many common Valentine's traditions – like chocolate and most flowers -- can be fatal to cats, dogs and other pets. Pets that have eaten chocolate – and that have come into contact with some flowers -- can show signs of poisoning within a few hours. If left untreated, they can die. · Both dark and milk chocolate can be fatal to pets, especially baker’s chocolate. Instead of dark or milk chocolate consider white chocolate, which is much less likely to cause a problem. · If you MUST have chocolate in the house make sure it’s kept out of reach. And don’t assume plastic wrap is enough to keep a curious kitty or pup from taking a nibble! · Sugar-free candies contain xylitol, which is dangerous if ingested. If your Valentine cannot have candy for health reasons, consider lovely baskets of dried fruits fresh fruits or nuts. · Lilies, tulips, carnations and baby’s breath are all toxic for pets. For cats, even brushing up against a lily flower can be fatal. Instead of fresh flowers, consider a silk bouquet (which also lasts longer!). · If fresh flowers are a must, ask the florist for a pet-friendly bouquet by substituting baby’s breath with greenery such as ferns, and using non-toxic blooms like roses, orchids, snapdragons, African violets, African daisies, or begonias. 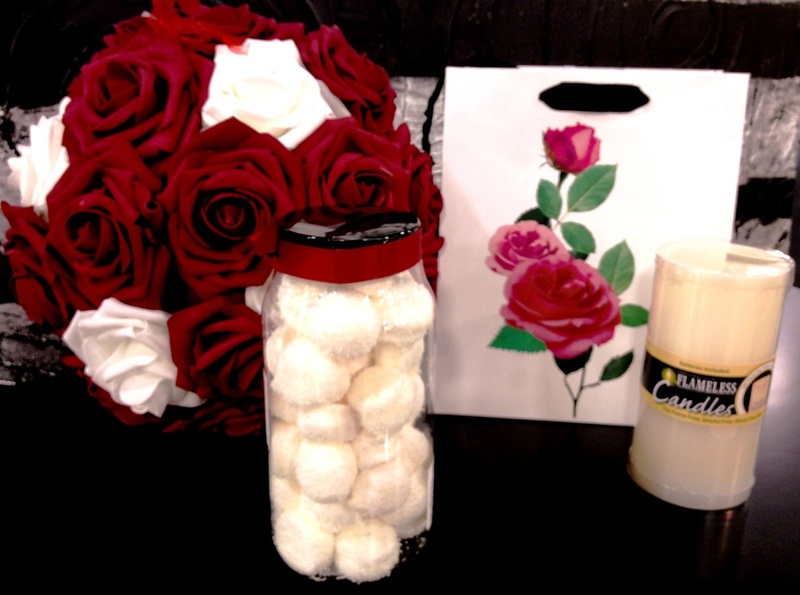 Silk flowers, white chocolate, flameless candles and gift bags without ribbon are pet-safe choices for Valentine’s. Items pictured from Home Goods. · Each year, pets get burned by hot wax or by catching their fur on fire in a candle flame. Instead of traditional wax candles, choose battery operated ones that provide the same romantic glow without the flame. · If candles are a must, keep them way out of reach of curious paws or noses. Choose candles in a glass jar that are less likely to leak hot wax or tip over. · Synthetic ribbons often get chewed up and can get lodged in your pet’s throat or digestive tract. Instead, consider a cute gift bag with light tissue paper, rather than decorative grass or ribbon. · Instead of traditional synthetic wrapping paper choose natural paper wrapping paper. Despite the best precautions, pets – like children – often get into things. Owens says that it’s always good advice to watch pets closely and take any behavior changes seriously. As a veterinary nurse and licensed veterinary technician, Owens works closely alongside veterinarians to act as a physician’s assistant in all aspects of veterinary medicine, including outpatient care, hospitalization, treatment, diagnostics and surgery. She has a special interest in pet behavior, and has been with The Cat Practice for 9 years. The Cat Practice, Michigan’s first cats-only veterinary hospital, opened in 1981. Open seven days a week and evenings, The Cat Practice provides advanced preventative and medical care with an emphasis on early detection to help cats live longer, better and healthier lives. Located at 875 South Worth in Birmingham, Michigan, The Cat Practice cares for feline purebred and mixed breeds from around southeastern Michigan. For information go to www.thecatpracticepc.com or call 248-540-3390. Luckily, Bazinga doesn't seem to interested in chocolate (but it's still put away out of reach) I do have to watch her whenever we have food with onions and/or garlic. Live plants don't do well in our home so we never bring any indoors. My biggest concern with our furbaby is anything with latex. Just last week she scared the heck out of me - I caught her in the process of consuming a rubber band; pulled it out of her mouth when it was 3/4 of the way down her throat!! Somehow, Bazinga had managed to get into where Hubby keeps them; the rubber bands have now been moved elsewhere. Wow... I didn't know that about lilies... Thanks for that for sure. Very good advice as always! Happily, Austin keeps away from chocolate and sweets etc. Well he has so far!! Great advice fur sure, be careful everyone! Super useful information - after all, Valentine's Day is about love and caring - not about having things around that might make our fur babies sick if they get their little paws on them! Thanks for the tips. Wow, I had no idea about the flowers! Great post! Those are all some great suggestions and so important. We sure don't want to end up at the vets. Thanks and you have a super Sunday. Happy Valentine's Day to ya! very spontaneous and curious creatures that are quick to get themselves in trouble by consuming something hazards or by engaging in something dangerous. Knowing how to respond in a situation where an animal's life is in danger is important. Also, many animals are victims to illness and accidents just like humans are, so being financially prepared can lessen any burden associated with emergency care. I never new that the ribbons on gift wrapping things could get caught in my cats throat! Thank you so much for posting this article, and helping me stay out of animal emergency treatment in Colorado Springs CO. Great article!